Salutations to my music video brethren! It’s Andy Gesner and the staff from HIP Video Promo, here to introduce you to a sensational San Antonio trio with an arresting sound and an exciting style, and one bound to leave an indelible impression on the indie rock underground. The young women of Girl In A Coma have named themselves after a Smiths song that needs no introduction here, and frontwoman and guitarist Nina Diaz has more than a little Morrissey in her powerful, elastic singing. But she may also remind you of Billie Holliday, Patsy Cline, Patti Smith, Karen O, and even Joey Ramone. Diaz’s voice is classic: robust, immediate, capable of expressing great sorrow and anger while simultaneously conveying punk attitude. It’s the sort of voice that announces the coming of a major band – a wail of emotional solidarity, and an arrow that penetrates a listener’s heart. 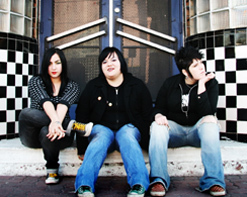 Nina Diaz, sister Phanie (drums) and friend Jenn Alva (bass) have been playing together since 2001, touring America, and refining and polishing their singular post-punk sound. Their songwriting is ambitious: they don’t always follow verse-chorus-verse conventions, instead letting the music ebb and flow around them, leaping deftly from passage to passage, and from riff to well-wrought riff. They’ve shared stages with Frank Black, The Pogues, Boz Boorer, The Epoxies, and many other indie rock notables, they’ve taken their unconventional act on the Warped Tour, and they’ll be hooking up with the annual Vans extravaganza later this summer. Both Before I’m Gone producers Erick Sanger and Gabe Gonzales of Sparta – another group of Texas indie-rock originals – preserve all of the idiosyncrasies of Nina Diaz’s singing and writing, but cranks up the volume for a bristling, electrifying rock set. We’ve included two Girl In A Coma clips on this reel – a video accompanying “Clumsy Sky”, the lead single, and another for the aching “Road To Home”. Both songs contain more musical moods and ideas than what can be found on most indie rock full-lengths, and Nina Diaz’s singing performances are spectacular throughout. Jim Mendiola – best known as the director behind punk rock films Pretty Vacant and Ozzy Goes To The Alamo – is another proud San Antonio weirdo, and in the “Clumsy Sky” clip, he coaxes the desert-Texan strangeness and charm from Diaz’s artful songwriting. Mendiola shoots the band in a dusty dive bar, and turns the room into a hangout for some of the freakiest characters in the Lone Star State (the three members on Girl In A Coma fit right in, of course.) These aren’t hipsters: they’re devoted music listeners, young and old, who casually express their personal styles under the smoky lights of the San Antonio nightclub. In other words, they’re a Girl In A Coma crowd. The “Road To Home” clip is a bar scene, too – but this one is even odder. Veteran director Greg Olliver (Joan Jett, Snoop Dogg, Burning Spear) places the three members of the band at tables surrounding a well-lit stage (Joan Jett herself also has a cameo in the video). But there aren’t many people in this club; on the contrary, there’s a half-open feel to the room that suggests that we’re watching a soundcheck or a rehearsal. Onstage, there’s a singer who is truly bizarre: “she” is an explosion of exaggerated womanhood, and her cosmetic mask has rendered her nearly inhuman (in reality it is the well known transvestite Amanda Lepore). The members of Girl In A Coma sing along, more to themselves than to anybody else, lost in a reverie of strangeness. Later, a man from the audience hustles into a dressing room, and inexpertly impersonates a woman. He appears onstage next to the singer – one performer disguising his gender poorly, and another who has pushed past femininity into a mysterious and disquieting netherworld where gender is nothing but imposture. This is a song about an outsider trying to fit in about who along the way finds themselves and discovers the beauty in being happy with how you are. Hot off the heels of bringing you the fantastic video for The Dollyrots “Because I’m Awesome” video, Julie Rader and the crew at Blackheart Records have delivered two more must see clips! And to be sure to keep you hooked up, they have supplied us with a plethora of copies of Both Before I’m Gone for all of your on-air giveaway needs! The band will also be on tour all summer long, so please be in touch to set up a video interview! If you need more info, call Andy Gesner at 732-613-1779 or e-mail us at HIPVideo@aol.com. You can also visit www.Blackheart.com or www.GirlInAComa.com to find out more about Girl In A Coma.